The jury selection process is an intriguing — and high stakes — venture into the subtle terrain of human nature. As you meet and interview all members of your venire, you’ll primarily be looking for reasons to de-select the individuals who bring a bias that will run against your case. Here are five factors that you should explore in the course of empaneling the most effective jury for your case. 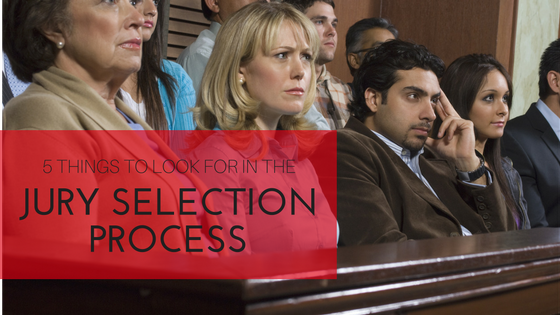 In selecting (or de-selecting) a potential juror, one important element to consider is the person’s previous life experience as it relates to the case at hand. For example, if a juror has ever been the victim of a robbery, they’re likely to harbor strong emotional memories of that event. If they were seated in a case trying someone on a robbery charge, it would be difficult for them to be unbiased. However, the relevance of any specific life experience can be very subtle, and the voir dire process must seek to uncover unconscious biases that may influence a juror’s ability to be impartial. In a case involving negligence that harmed an older person, for example, a juror who was raised by a grandmother might harbor certain biases without even being aware of it. A wide-ranging voir dire conversation should range over such topics as personal relationships, childhood experiences, and future plans, as well as the more obvious areas that specifically pertain to issues of the case. Jurors’ life experience, and the common sense that it can instill, is a positive quality — but only if it’s free of specific events that somehow trigger an emotional reaction to your case. The justice system depends on each member of a jury being confidently able to express their personal opinion. While juries engage in collaborative thinking and discussion, it’s essential to seat jurors who have the courage of their individual convictions. For this reason, your jury selection process must uncover and eliminate any juror who seems unduly concerned with whether they will be judged and criticized by others. A skilled interviewer will evaluate the personality qualities of potential jurors, seeking those who are straightforward and assertive, while avoiding those at both ends of the personality spectrum: an impartial juror cannot be fearful of being judged by others, and they also cannot be excessively dominating or socially overbearing. These days, the process of jury selection has been transformed by the prevalence of online conversations. Choosing the best jurors for your case no longer depends exclusively on each person’s answers to a questionnaire and their responses during the voir dire interviews. Your due diligence when empaneling a jury now includes checking each potential juror’s social media posts to ascertain the person’s perspective as it affects the case. This background-checking process involves looking deeper than simply searching for any comments about the actual case that is being tried. You also need to examine social media profiles to gain an overall view of each person’s general worldview, lifestyle and political stance. For example, a potential juror with very strong online statements related to gun control may not be able to be unbiased when seated on a jury for a gun-related crime. For better and for worse, the legal system and its occasionally dramatic moments make up a popular theme for mainstream entertainment. As a result, some of your venire members may already feel that they know how the case should proceed legally. These individuals may in fact feel that they are ideal jurors, because they are familiar with the courtroom setting and “know what to look for.” In fact, it’s very important to closely examine the suitability of such knowledgeable (or pseudo-knowledgeable) people because they can often prove stubborn in actual deliberations. Furthermore, there’s a risk that they could attempt to use their legal knowledge to influence their fellow jurors. It’s not uncommon to find jurors who believe wholeheartedly that they are capable of being unbiased, but who in fact maintain a point of view that prevents them from viewing a case impartially. Personal bias results from numerous factors. For example, a juror may simply know too much ahead of time about a case, even if they claim that they haven’t formed any opinion about it yet. You want your jurors to learn about the case during the course of the trial, not to come in feeling that they already know what happened. Having to work against the bias of press coverage is not optimal when presenting the facts in the courtroom. Designing relevant voir dire questions is a surprisingly complex art. You are seeking to uncover attitudes and biases that the potential juror may not even realize they hold. Your questions must be framed in an open-ended manner in order not to spell out the response you’re actually looking for. The process must create a sense of comfort in the potential juror so that they feel freely confident to explain their thoughts and experiences. Furthermore, you must be constantly observing and evaluating non-verbal cues in their responses as well. Pretrial research methods such as jury monitoring and online focus groups can provide you with valuable context for understanding the attitudes of certain demographics towards the case. You can use these tools to inform your voir dire interview. Come explore our free guide to creating bulletproof trial graphics to ensure that you’re ready to win your case.